This collection features networking hardware we have gathered over the years for both office use and testing purposes. This collection includes Marconi ESR-5000, 3com RAS 1500, Cisco 2524, Cisco 2600, Cisco PIX 506e, Riverstone RS3000, Juniper IDP 50, NetScout nGenius, RadWare WSD-DS load balancer. 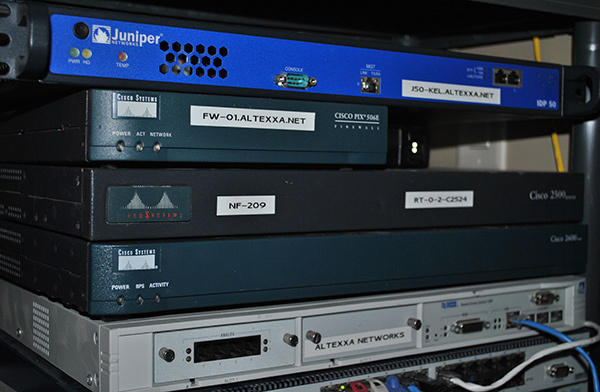 Our collection of rack mounted network routers and firewalls mostly consists of items once used in production but have since been replaced with newer equipment. This section includes a 3COM Remote Access Server 1500, Cisco 2611 router, Cisco 2621XM router, Cisco 1760 router, Cisco 2524 router, Cisco PIX 506e firewall, Juniper IDP 50 firewall, NetScout nGenius monitoring appliance, ASG 320 security gateway, RadWare WSD-DS load balancer, Sonicwall firewall appliance. This beast of a layer 2/3 switch was once used for local area network connectivity when all of the Higher Intellect servers were run from a central office. It features 10 gigabit fiber ports and 20 copper 100Mbit ports. As the core servers are now located within colocation facilities, this has been entered into the museum and sits unused. This unit is part of Altexxa Group's network research lab for studying traffic flows and experimenting with routing protocols. It is outfitted with an NPE-G1 engine, T1 line card, DS3 line card, serial line card and a few extra ethernet ports.